For the next seven days, I will do something I’ve never done before: eat like a vegan! I’m doing this for a few reasons. 1. If I’m going to be providing nutritional counseling in a few years, I want some first-hand experience under my belt. Not that I’m about to try to give myself diabetes so I can better understand what it’s like to eat in a way that manages it, but I think it would be helpful to know what it’s like to cook like a vegetarian or vegan, even briefly. 2. It’s summer, I have extra time on my hands, and I need something to challenge me to experiment with new recipes. And why vegan? Well, vegetarian’s just too easy for me. My diet isn’t very meat-heavy as it is, so it wouldn’t be a true challenge. So last night I opened my fridge, told my organic 1% milk, my feta cheese, and my free-range eggs to please not go bad, because I’d be back for them soon. And I headed off to the grocery store to equip myself for the next day. My go-to breakfast, especially on weekdays when I’m taking it to work, is greek yogurt with some variety of fruit and sometimes granola, wheat germ, oats, or cereal on top. 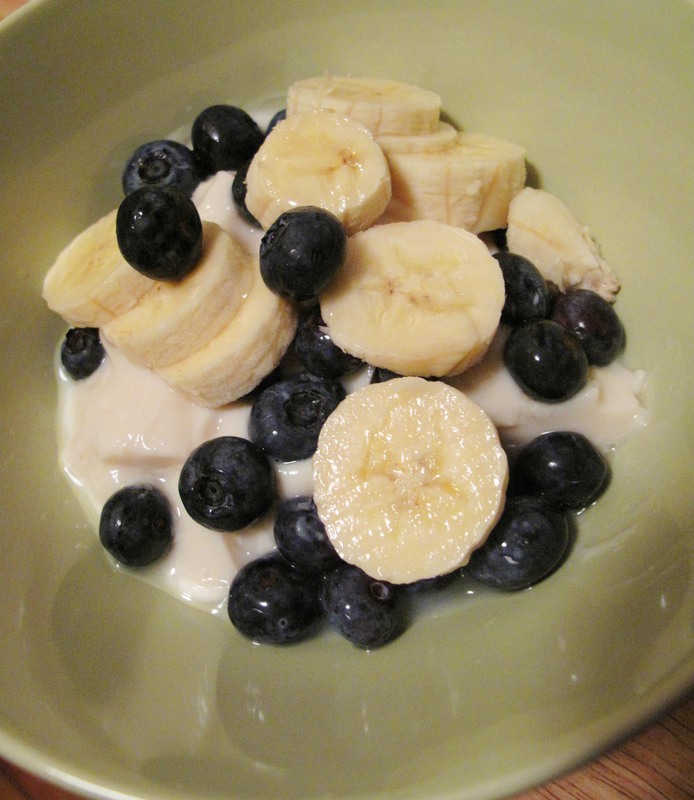 So for my first morning I went for the vegan version: O’Soy vanilla yogurt with blueberries and sliced bananas, and an iced coffee with organic almond milk. I tried soy yogurt once a few years ago, when I lived with a lactose-intolerant roommate, and as far as I can remember I was not a fan. But Vegan Week is about experimentation, challenge, and giving things a second chance, so I was ready to try it again – although my expectations were not high for this breakfast. I also had a choice to make regarding milk for my coffee: soy, almond, or rice? Rice milk I thought would be too watery for coffee; I use 1% milk in my coffee, not whole or half and half, but I still like a hint of creaminess, and rice milk just doesn’t have it at all. I like soy milk, and the protein content is comparable to cow milk, but I used to be mildly allergic to it, and since I was already getting soy yogurt for breakfast, I figured I shouldn’t overdo it on the soy. Almond milk is lower in protein than soy, but it’s a great source of vitamins and minerals and I love the taste, so I went with Pacific organic unsweetened almond milk. The results? I was pleasantly surprised with the yogurt. It wasn’t the chalky gelatinous goo I remembered from years ago. It definitely didn’t taste like greek yogurt though, which is what I’m used to. It was very sweet and, to me, needed that tart element. I found some lime in the fridge and gave the yogurt a good squeeze of juice. Amazing! Now it tasted like key lime pie. I could eat this again. The almond milk formed a few strange lumps when it hit the coffee, and if I let it sit it would collect at the bottom, but it tasted fine. Not as creamy as 1% milk, but I like the subtle nutty flavor with the coffee. 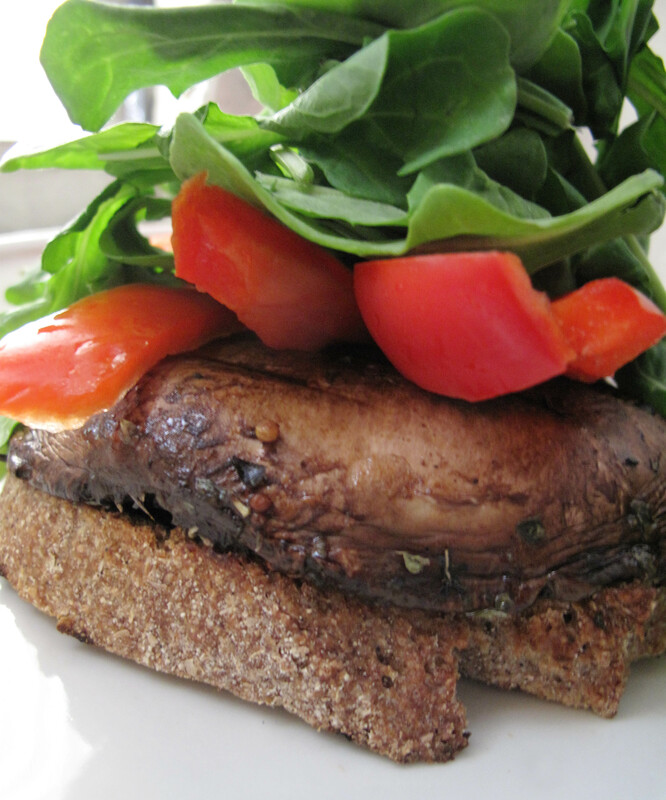 For lunch I made a grilled portobello mushroom “burger” with red peppers and arugula on farmer’s market whole wheat sourdough. I marinated the mushroom in olive oil, balsamic vinegar, dried oregano and basil, whole grain mustard, and black pepper, and then grilled it in a cast iron grill pan for about 8 minutes on each side. I quickly realized an open-faced sandwich with a knife and fork was the way to go with this one, considering the size of the mushroom. After putting the portobello on top of lightly toasted bread and topping it with the peppers and arugula, I drizzled the rest of the balsamic marinade over it. It was great, although I couldn’t help thinking it would have been truly fantastic with some goat cheese… hmm, is there a vegan goat cheese substitute? Now here’s the catch: I knew going into this that I had dinner plans with my friend tonight, and the place we always go is Momofuku. It almost made me start Vegan Week tomorrow, but I knew that would be cheating because the whole point is to live my “normal” life while eating like a vegan. This friend is pescatarian (vegetarian but eats fish) though, so when I go there with her it’s not like we’re sharing giant slabs of pork belly anyway. So I survived not putting pork broth on my ginger scallion noodles, and I assumed (like a very, very bad vegan) that the shiitake buns do not contain animal products. The hard part was resisting special appetizers like charred octopus with fennel, yogurt, and grapefruit, or the carrot-ginger/cheesecake soft serve ice cream! But I did it. At least sake is vegan. This entry was posted in Cooking adventures, Dining out, Vegan and tagged vegan, vegetarian. Bookmark the permalink.